“Know your limits” is a life motto that can easily be applied to the effective use of resource planning software for project management. Investment in a resource management tool such as Ganttic is for many companies triggered by a desire to streamline their projects; to see what is going on from day to day. Although they can take this as far as they want, planning weeks, months, or years ahead, it’s important to be clear from the start about how they want to use the platform; and realistic about the time they have for planning and scheduling. Each business has its own objectives and the best resource planning software is flexible enough to achieve a variety of goals. From the user’s perspective, it’s important to know how far they want to go with it, what functions they need and what they don’t. As time management is key to projects running smoothly, with maximum efficiency, there is a danger of spending too much time on administration. 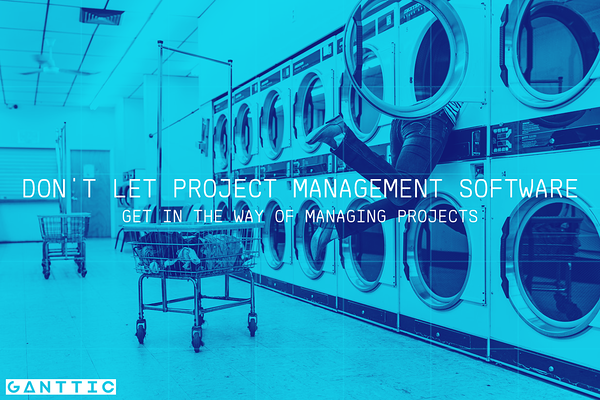 The scope of some resource management software is such that it’s possible to bite off more than you can chew, leaving time-pressed project managers feeling overwhelmed. At Ganttic, we see clients using our resource planning software in lots of ways. 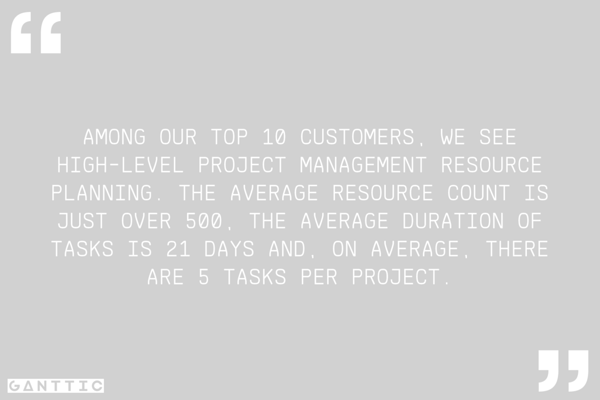 Among our top 10 customers, we see high-level project management resource planning. 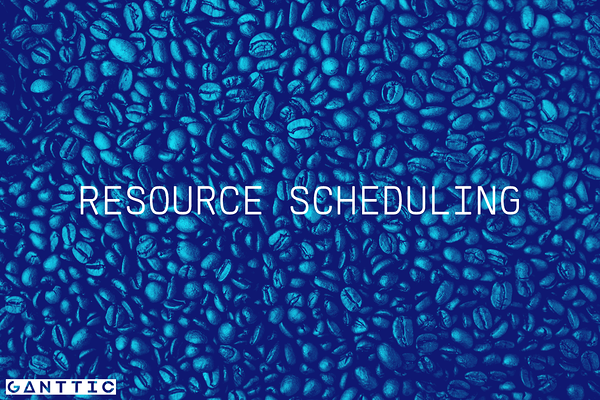 The average resource count is just over 500, the average duration of tasks is 21 days and, on average, there are 5 tasks per project. But there is a huge variation to come to these averages, so naturally, there is no one-size-fits-all approach. What is the best practice to avoid over-administration? Our number one tip would be to take advantage of visual resource planning functionality. For example, users of Ganttic can create charts that give them the best possible overview of their plans, and they can change the view to visualize either the projects or resources perspective. This makes it easier to make informed decisions quickly, which saves a lot of time in the day-to-day that would be otherwise spent cross-referencing information. Can “too many cooks” lead to time-wasting and confusion? In some instances, having too many people on a team involved in planning and scheduling resources, tasks and projects can lead to chaos. When we first introduce Ganttic to a would-be client, there is sometimes trepidation that the platform allows an infinite number of users at no extra cost. This can be helpful in very large organizations, however, and the way to stem the flow of information is to give each user bespoke permissions. So, they can collaborate as much or as little as needed. Can the amount of data available become disordered and bewildering? It’s a fear of many resource planners that they simply have too much data to handle and make sense of. This is a natural concern of our clients and they are reassured to learn that there are almost endless possibilities to customize data fields and create different views and filtering. You could say that was a bit mind-numbing, but there is no need to use everything that’s provided. You can keep it simple if you’re afraid you won’t have time to learn and implement everything that’s on offer. Essentially, if you opt for the right resource planning and project portfolio management software, you can find a timely way to administrate the system, integrate it into your daily schedule, involving as many or as few of your team as you like. If you choose Ganttic, we’re confident you will find it is easy-to-use and flexible, so you and can shrink or grow its capabilities to match your business goals within the time you have available. 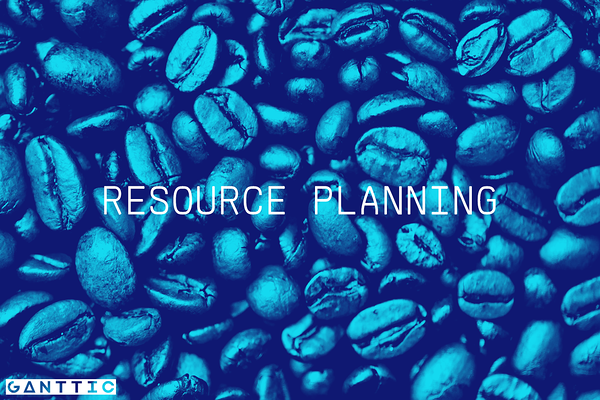 We have defined three types of resource planning. There's scheduling, there's planning, and there's management. All three can seem similar but they do have some substantial differences. A report revealed that 74% of project managers use between two and five tools, and 95% are using two or more. This is a recipe for disaster, right? It’s a time poor way to project management and is open to no-end of inefficiencies and errors. We recommend one tool to do the job of everything – project management resource planning, tracking utilization and generating reports. And, though we may be a little biased, Ganttic is an excellent tool that will save your time and make your job easier. We realize that taking on a new tool can seem like climbing an epic mountain, especially if you have staff and resources around the globe that need to be on the same page. So, if you are looking for advice on how to use Ganttic to maximize efficiency and project success rates, we would be happy to offer you a free demo. We are always on hand to provide training on the best use of our platform within your organization.